We always knew Alaska was a destination for us. 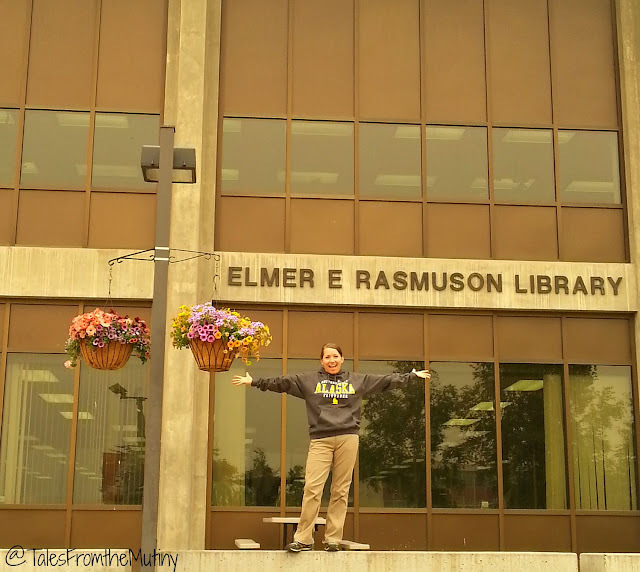 I (Lynn) graduated from Ben Eielson Sr. High School near North Pole and attended the University of Alaska Fairbanks. Having lived there from 1987-1992 I’ve always felt an emotion bond, so to speak, with the area. If you’ve ever spent time there…really, good, quality time…then you understand. As for Clark, well he’s always wanted to visit the places I grew up. Being an Air Force brat that means a lot of places including our visit to the Poconos in fall of 2013. And you really just can’t beat the beauty that is Alaska. Sure, some places may share a few similarities but all in all this entire state is utterly stunning, no matter where you go, no matter how many miles you drive…yes, the entire state. I can finally afford my very own UAF sweatshirt…something I couldn’t when I was a student! Our plans began to solidify when our niece, Christina, sent out a “save the date” for her wedding which is to be held the first weekend in September in Seattle. Knowing we needed to stay “close” to the Pacific North West so we could attend the wedding made the decision to do it this year even easier…and the falling gas prices sealed the deal. During these early planning stages we had no idea that several hundred a dozen or so of our IRL fellow fulltime friends, and a handful we had yet to meet in person, would also be making the trek. How did we prepare for this grand endeavor? Let’s face it, Alaska is far away from everything. Even using our jump-off point of Ferndale, Washington it’s still roughly 2,000 miles from border to border. That doesn’t take into account any side trips or actually driving into the state. And that’s one way. Before we left I’ll admit this didn’t faze me one bit…until we were somewhere in the Yukon and had hundreds of miles more to go. So the first thing to embrace is the fact that you’re going to drive…a lot. 1-The Route. Truth be told we didn’t do much in the way of planning. Sure we bought the Milepost (which I firmly believe is worth the $25 investment) and we got health certificates for the animals. But aside from that we kept everything somewhere between “I know we drive North and then West” to completely unscripted. 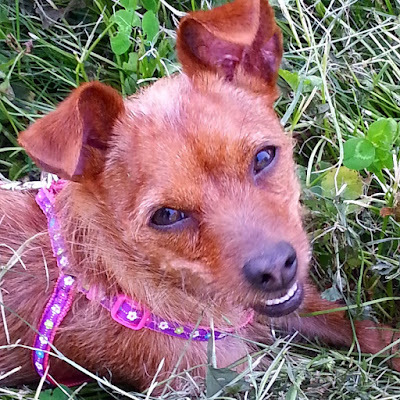 So unscripted that we actually ended up adopting a rescue dog 10 days before we crossed the Canadian border…because why not travel across international borders and undertake a big adventure like Alaska with a new dog? 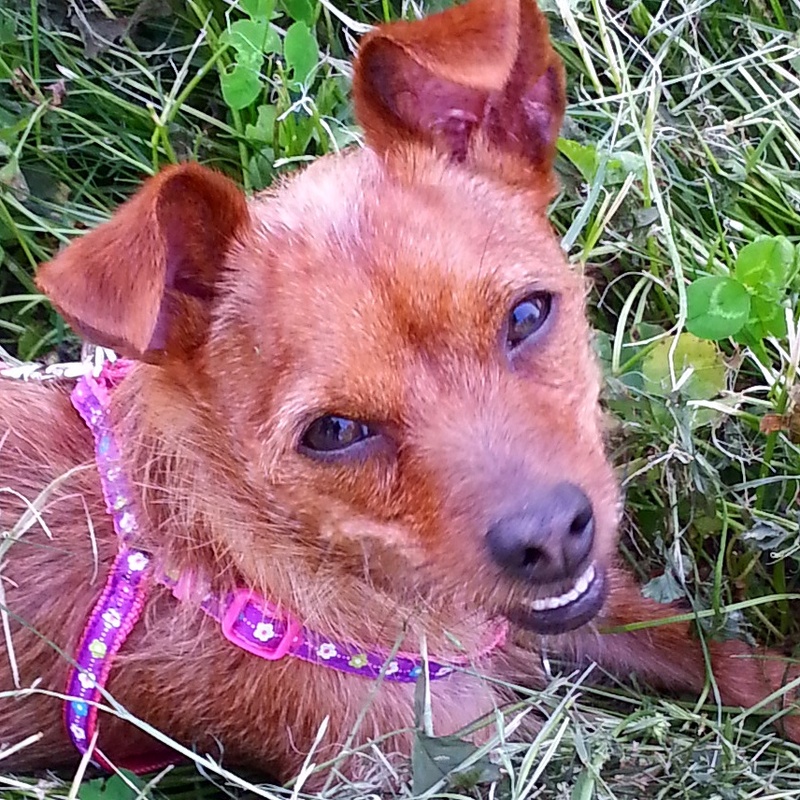 Meet Nellie…our newest crew member! We connected with our friends The Snowmads, who had also decided to spend the summer in Alaska, and met up in Ferndale so we could cross the border together. Although we originally thought we’d travel the majority of the way through Canada together it became apparent after 3 days that the pace was going to be too fast for us. The Snowmads work fulltime while RVing making it necessary for them to get through Canada as quickly as possible so they could get back to their jobs. So, in Prince George we made our goodbyes knowing we’d see them again in a few weeks in Fairbanks. Crossing the border in Sumas, WA with the Snowmads. Somewhere along the way we decided we’d take the Cassier Highway to Whitehorse and then come into Alaska via The Top of the World. You can click this link (fingers crossed it works) to view the first leg of our journey along with the places we stopped for at least one night. Side tip: I wanted to emphasis how important we found the Milepost to be for our journey. We were pretty much completely without Internet for most of our travels through Canada , and we took 3 weeks to complete that leg. I then found out that my Straight Talk phone (on the Verizon platform) was not supported in Alaska and was virtually useless unless I could connect to a wifi hotspot. Having an actual paper copy of this guide helped us find overnight spots and gas stations along the way. 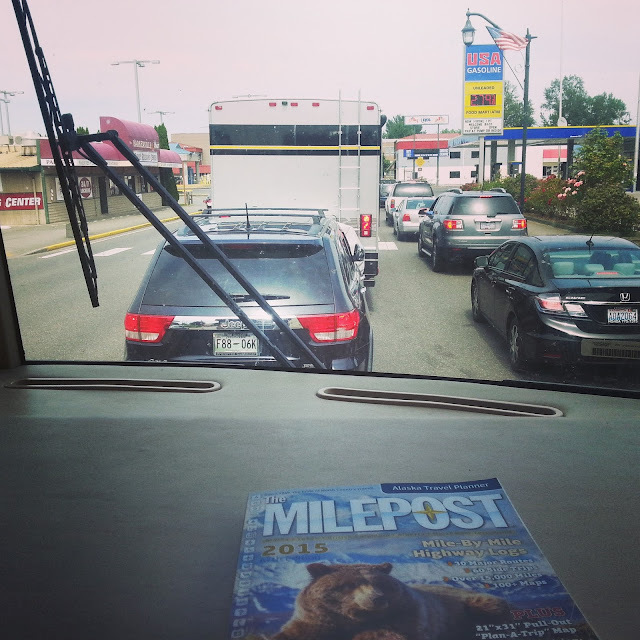 We also made several unforgettable side trips thanks to the tips in the Milepost. 2- Ditch the “extras”. There are restrictions on what you can bring when crossing into Canada. At the time of our crossing things like raw poultry (to include fresh or frozen products as well as eggs), certain amounts of booze and beer, hand guns, ammunition, citrus fruits and a variety of other items were restricted or banned. So we stashed the majority of our liquor, although I now think it was unnecessary, as well as a few other prohibited items hoping for a smooth border crossing. We’d also off-loaded quite a bit of “stuff” at our friends, the Ormiston’s, house in Ferndale, Washington. 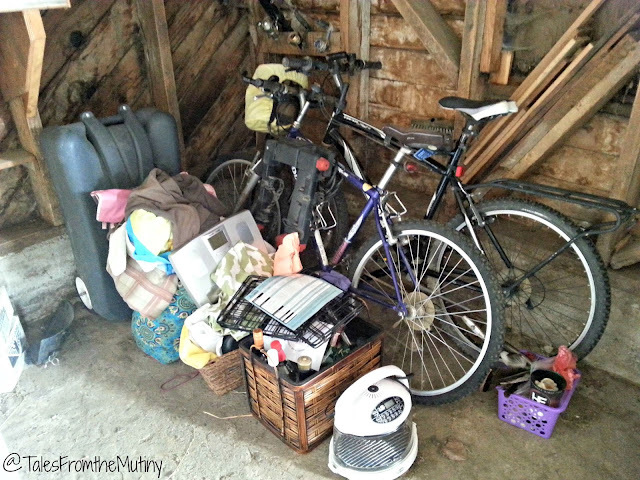 For a while now we’ve been weighing the pros and cons of keeping our bikes, which we seldom use, along with some random items we’ve been carrying in the RV these past 2.5 years. So, we made a huge pile in a corner of the Omistons’ barn, covered it all with a tarp and decided to see what it would be like to live without it all during our 3 month trip to and from Alaska. As of this writing (2 months in) we haven’t missed a thing (other than the booze)…and can barely remember what all we left behind. We’d long been contemplating the advantages of a gas fire pit, especially after hanging out with Imperfect Destiny in Tucson last summer. It takes up less space (considering we were already carrying an extra propane tank anyway) and we can use it in more places. Many campgrounds, RV parks and public lands are limiting or restricting the use of wood fires these days. 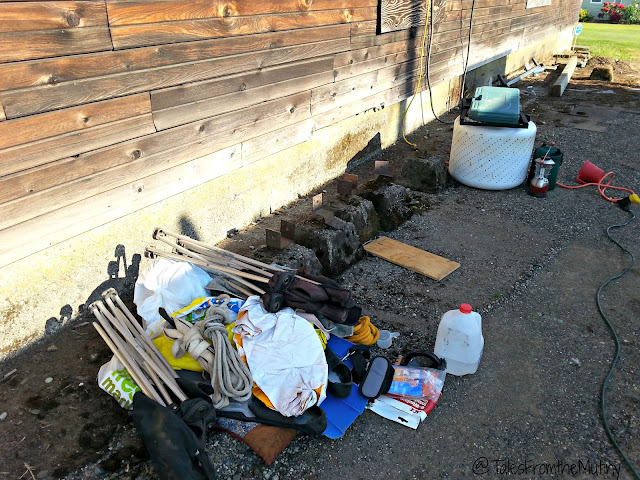 This is a portion of the stuff we donated or discarded…including the wash barrel that was once our fire pit. Here’s the pile of stuff we stored and will go through once we return to Washington (in a few weeks). Most likely it will all get donated…except for the alcohol. We’ll probably be adding to this pile once we return. Purge baby purge! 3- Secure what you can. 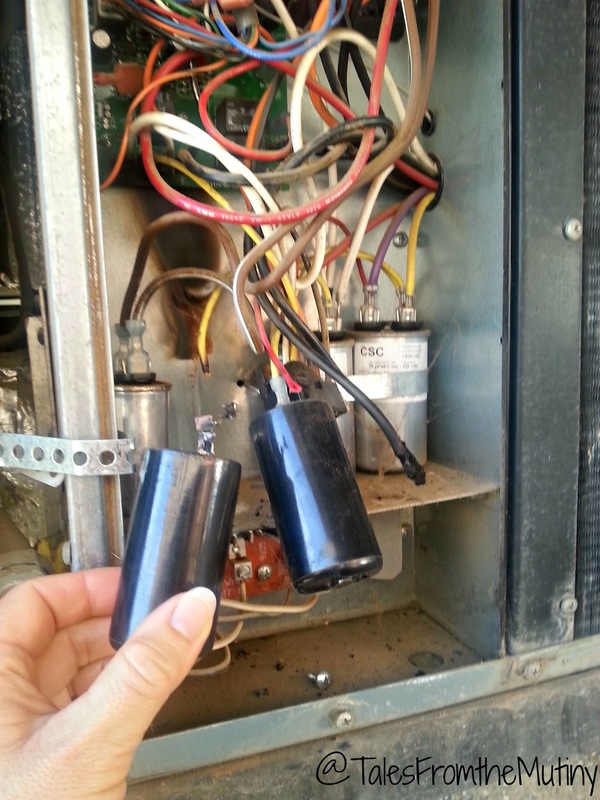 Even though we’ve been fulltiming for 2.5 years we still have “stuff” that seems to float around the RV, meaning it hasn’t been taped, glued, nailed, screwed, Command stripped or otherwise permanently affixed to something. The more we boondock, the more we realize that loose stuff is a pain in the a$$. Combine that with the knowledge that every highway leading to Alaska is a work-in-progress and you’ll understand why we took the time to make sure all of our latches were working and why we either secured loose articles, found new storage solutions for them or left them behind. Trust me, even with these precautions your stuff will still shake loose, fall and break or become annoying rattles that will set your nerves on end. There are many options out there for protecting your towed while traveling. We chose this $10 yoga mat. It’s served us well. Unfortunately, we failed to consider the beating our headlamps would take. 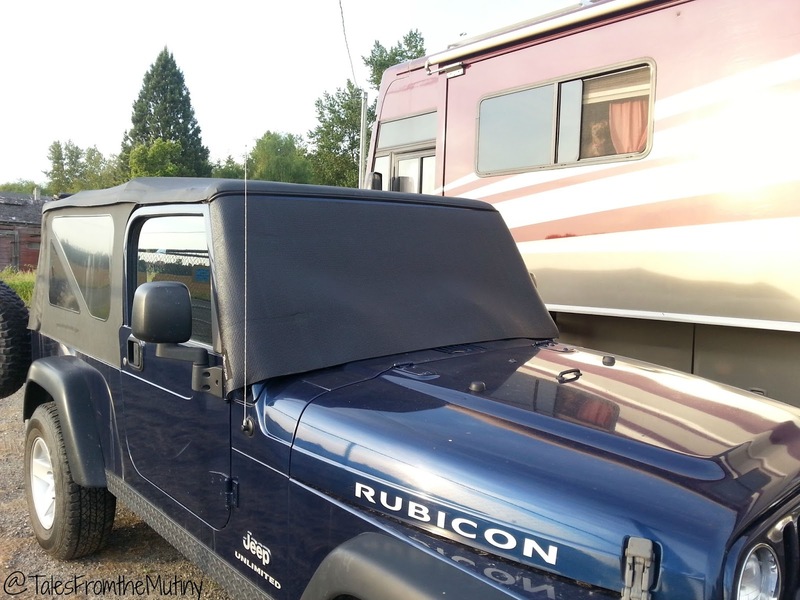 They now need replacing…but our windshield is in perfect shape, so there’s that. 4- Do your maintenance and make those pesky repairs before you head into the Great White North! 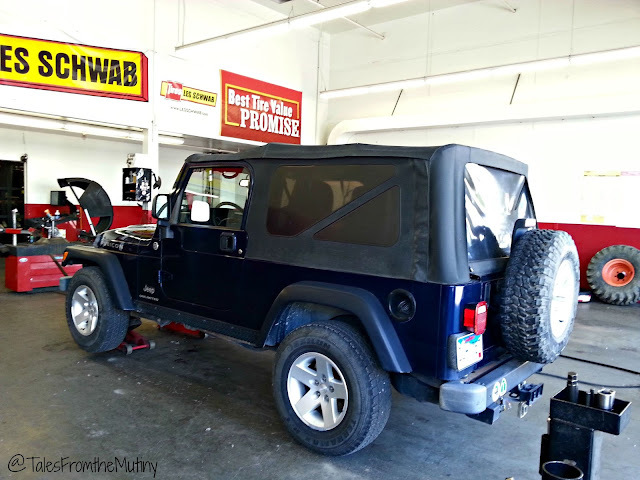 It’s a long road to Alaska and even once you get there repairs and maintenance aren’t always cheap, convenient or quick. About due for an oil change? Get it done before you go (and perhaps schedule one while you’re in AK). Tires borderline? A new set is an investment you won’t regret. What you will regret is trying to find a place to not only pull over to safety on tight roads but to also find replacement tires or a tow. 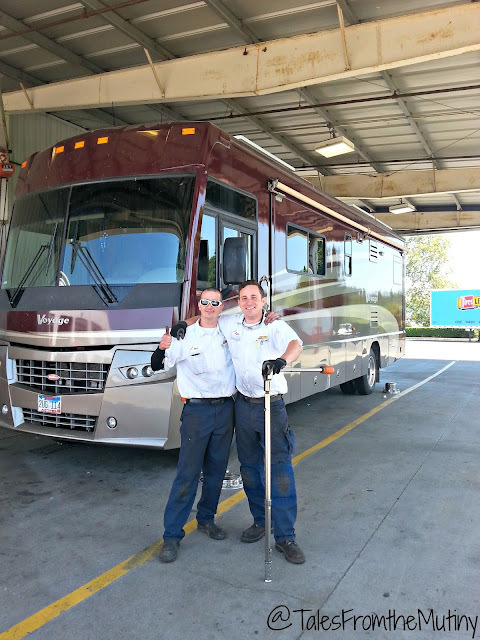 We replaced all 6 of our RV tires simply due to age prior to leaving the lower 48. Also be sure to get your brakes checked on all of your rigs. Sure we should all be doing these anyway but when traveling through Canada, and many areas of Alaska, cell phone coverage becomes a luxury and calling for help is often out of the question. We were “lucky” to have our brake caliper lock up on us prior to leaving Washington. Although not a planned expense, it offered us peace of mind to head north with a sound brake system. Believe it or not, our AC capacitor decided to almost catch on fire just a week before we were to leave for Alaska. Was it a sign from the powers that be? Maybe. Regardless, we were able to replace the parts ourselves (with the help of our friend and host Michael) and it was a great wake-up call to check over the RV wiring, screws, hinges, hoses, etc, before we headed across the border. We were *this* close to brushing off our 500 mile tire torque check up but with what appeared to be a string of bad luck (the Jeep brake caliper and then the AC capacitor and near fire) we decided it was a must. So glad we did…these guys found one tire that was FAR from being at the proper torque specifications. Those bumpy roads would have done a number on the rig for sure. 5- Fill prescriptions. Luckily for us, we don’t take any prescribed medications. However, I do wear contacts and I was on my last couple of lenses (mine are good for one month and then must be tossed). Knowing it would be a hassle to try to coordinate ordering and delivery when we didn’t know where we planned on being in the first place, I made sure to have a dozen of them delivered to us in Washington well before we crossed the border. Side tip: Just like one would do with prescription meds, I like to keep spare contact lenses in our first aid kits just in case I lose one during a hike or day adventure. 6- Stock up on a few things…but not too much. With limited storage space it’s not hard to over-shop so be smart about it. Neither Canada nor Alaska are third world countries and one can generally find things like toilet paper, food items and even toothpaste (can you believe it??) in these wild places. As a matter of fact, minutes after crossing the border we were in a Costco parking lot! But you may want to stock up on a few of your absolute favorites or specialty items if you have the room. For us that meant good coffee (for some reason Canadian grocery stores don’t seem to have a lot of choices unless you like Nescafe), good beer and wine (just remember you might be risking confiscation at the border…although no one we know had to forfeit any of their alcohol) and maybe any specialty pet food (our cats are on 80% canned food). Other than that you’ll likely be able to find plenty of supplies along what ever route you take. Side note: I eat a plant-based diet and our friends The Learning Banks are gluten-intolerant. We were all pretty successful finding grocery stores and restaurant options throughout our travels in Canada and Alaska without much hassle. In the Costco parking lot just minutes after crossing into Canada. 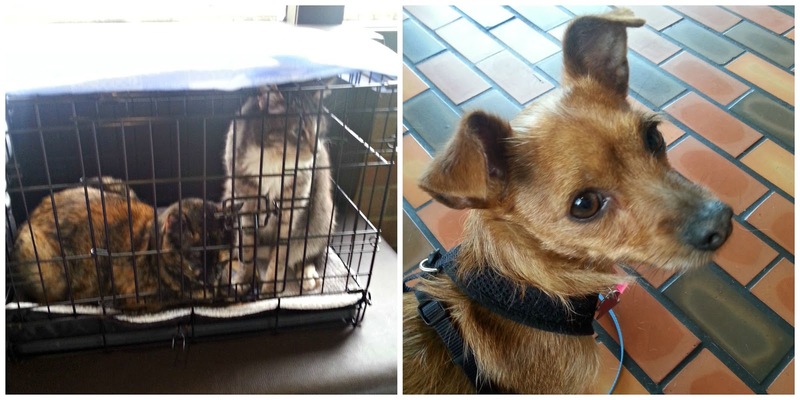 The not-so-happy campers at the vet. 8- Be flexible (if possible). There were several times we altered our route for various reasons. First, we opted to take the Cassier Highway over the Alcan once we reached Prince George. As tempting as the Alcan seemed we knew we preferred to stay more in the “wilds” and opted to visit the small towns British Columbia had to offer. The Alcan has increasingly become more of a thoroughfare…which is fine if you need to make time and get through the country as quickly as possible. We didn’t need to do that and wanted to increase our chances of wildlife encounters and off-the-beaten-path adventures. Additionally, once we heard the Alcan was is pretty rough shape from Burwash Landing to the border we chose to drive the Top of the World Highway…after all, if we were going to get rattled to pieces why not do it with scenic views and an awesome stop over in Dawson City? 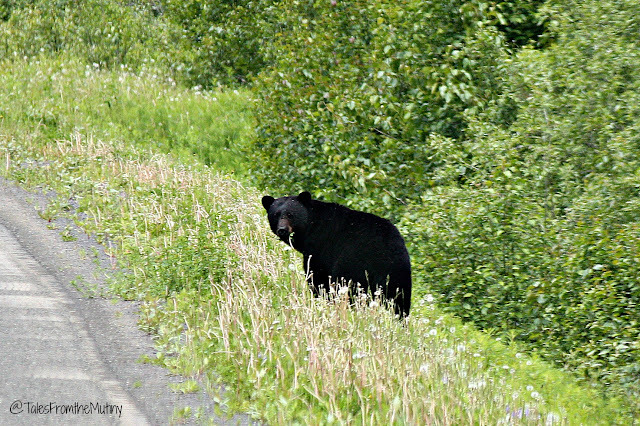 A black bear enjoying a roadside salad along the Cassier Highway. 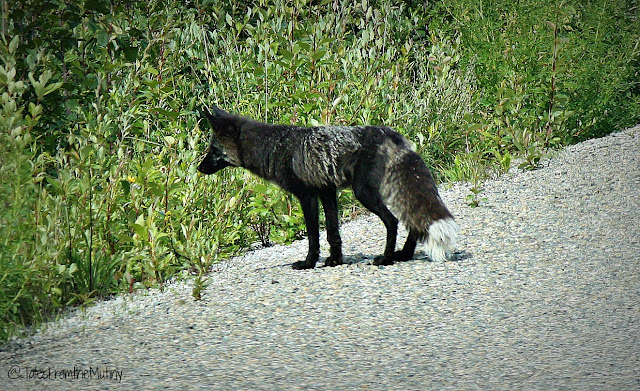 A black fox near Whitehorse. 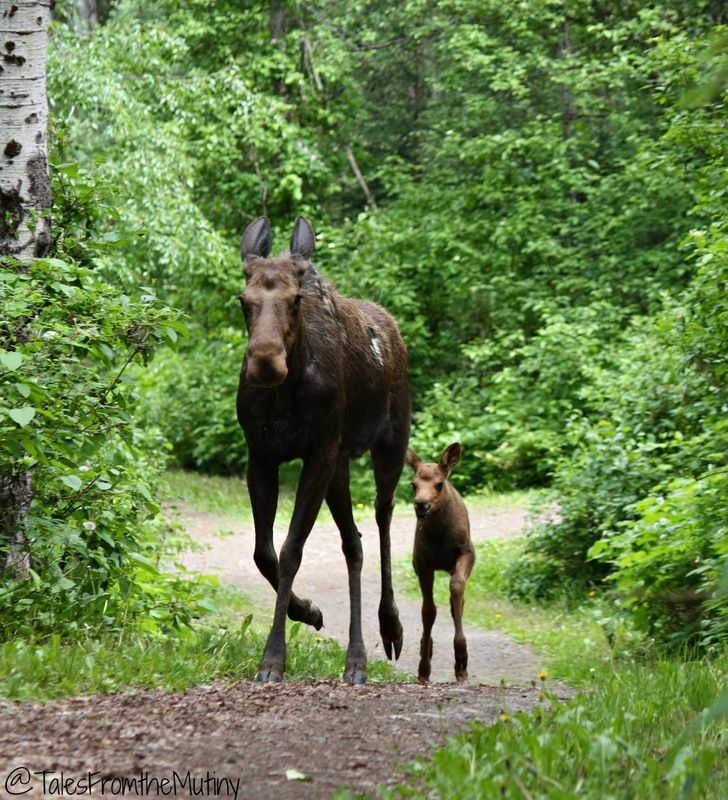 Mama and baby moose in Smithers, B.C. Once we arrived in Fairbanks we changed our plans again due to the many wild fires in the state. We’d loosely planned to just head south from Fairbanks through Denali and Anchorage and then hit the Kenai Penninsula and beyond, traveling in a counter-clockwise fashion. The heavy smoke and possible road closures prompted us to head clockwise even though it meant backtracking. This put us at the Copper River in Gulkana followed by Valdez, McCarthy & Kennicott, Anchorage, Girdwood and then Seward on the Kenai. I think it worked out for the best as we were able to follow almost perfect weather and clear skies for most of our travels. Of course, a major to-do in Seward really changed things up for us and the tail end of our adventure has all but disappeared. This is why I’m typing this as we “camp” in the RV lot at Providence Alaska Medical Center in Anchorage and not from Homer or Hope or Denali or Talkeetna…but more on that later. 9- Ask questions and do some research. So even though we didn’t do a lot of planning we still had an idea of what all we wanted to experience in Alaska. We spent time looking over Gone With the Wynns itinerary and also read through many of His and Hers Alaska blog posts. 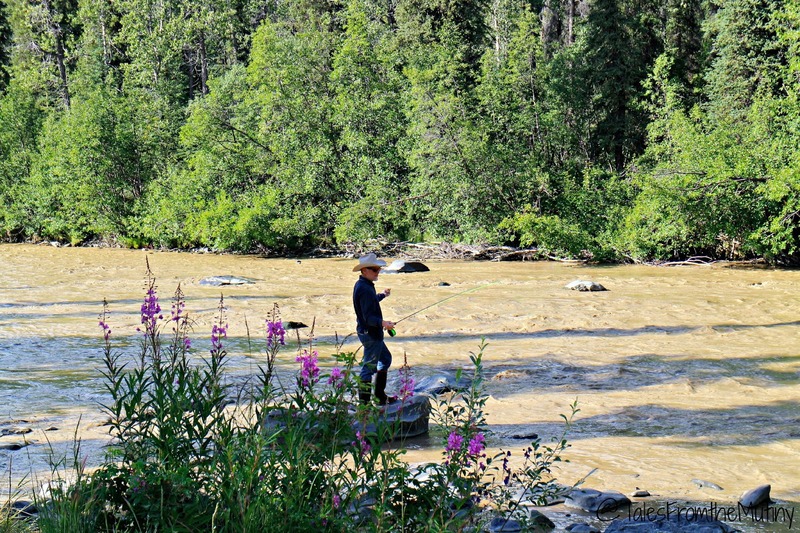 I read comments and suggestions left on various blog posts about the “must-dos” and various suggestions left by those who had recently visited or currently lived in Alaska. Once we realized so many of our friends and fellow bloggers/instagrammers were going to be in Alaska I created a Facebook group where we could share tips, suggestions, road information, camping sites or just to ask questions or plan meet-ups. I think it worked out beautifully and certainly gave us some great ideas. We would have missed out on some great adventures had it not been from recommendations from others in that group. 10- For the love of all that is holy, get out of the cities and tourist towns! It never fails to surprise me that people would make this huge trek up to Alaska (and back) just to visit the “big cities” and touristy areas almost exclusively. I get it, we all have different tastes, desires, goals, needs and “things” that feed our souls. But there is soooooo much more to Alaska than Fairbanks, Anchorage, Homer, Seward and Valdez. Of course we visited all of those places because it’s hard to get around the state without doing so…but some of our best experiences…the experiences that (for us) truly capture the feeling and idea of the Last Frontier, were all of the places in between. Alaska is still wild and untamed…it’s not all Costcos and free parking at the Walmart. We found plenty of free parking along roadside pullouts that offered million dollar views and some of our best adventures were at off-the-beaten-path places (even if they were in the towns listed above). There’s a great mix of adventure and big box stores to be had up here. Just don’t be afraid to seek out the wild bits. You won’t regret it. One of the sites we stayed at was in an abandoned state campground. We had the whole place to ourselves with it’s rushing, silty creek and wild flowers growing out of control…truly heaven on earth. We stayed 3 days with nothing to do (no internet even) but work on our fly casting and take photos of flowers. As our stay in Alaska winds down I’ll be adding more blog posts telling you everything we did and the places we stayed. While not all were home runs, we feel we had an exceptional experience during our visit. We did things we’d never imagined we’d do in this lifetime. And we bonded with new friends over incredible adventures. We had a lot of down time, getting closer to nature while recovering from long drives, and saw some of the most beautiful scenery and wildlife to date. I hope you’ll come back and check those posts out. In the meantime, here’s a fantastic post from our friends Josh and Marie, aka Ardent Camper, titled 15 Tips for Driving Your RV to Alaska. 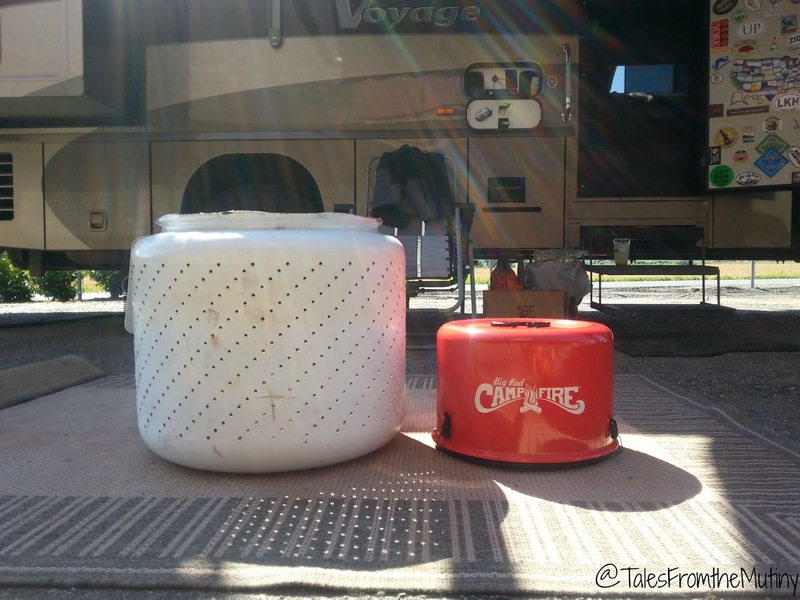 And this post by Gone With the Wynns about crossing the Canadian border in an RV. 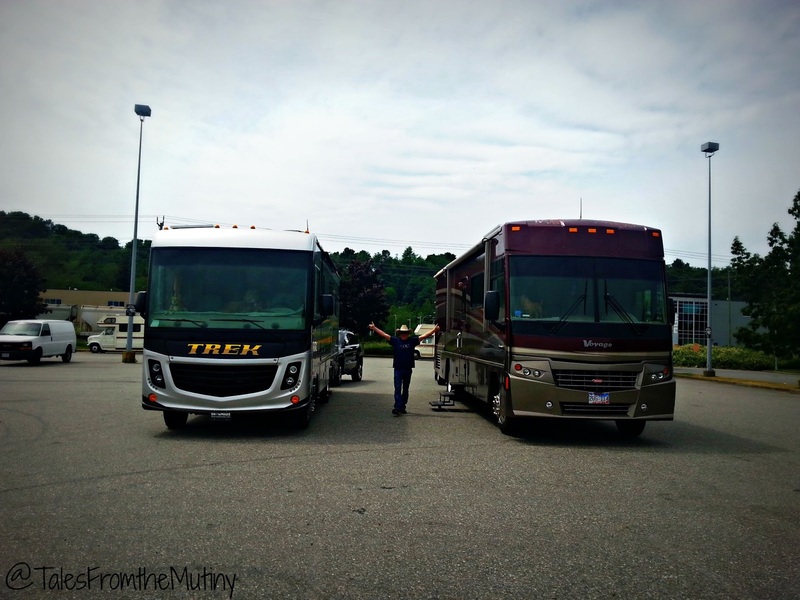 And finally, this guest post by His and Hers Alaska about the Myths Versus Realities of Driving Your RV to Alaska.